1 A None No Power Seat 1 A is a standard First Class seat. The proximity to the lavatory and galley may be bothersome. 1 B None No Power Seat 1 B is a standard First Class seat. The proximity to the lavatory and galley may be bothersome. 1 H None No Power Seat 1 H is a standard First Class seat. The proximity to the lavatory and galley may be bothersome. 1 J None No Power Seat 1 J is a standard First Class seat. The proximity to the lavatory and galley may be bothersome. 11 A None No Power Seat 11 A is a standard Extra Comfort Class seat located at a bulkhead and has additional legroom. Hawaiian Airlines charges an extra fee to reserve these seats. The tray table is in the armrest, making the armrest immovable and slightly reducing seat width. There is no floor storage for this seat during takeoff and landing. 11 B None No Power Seat 11 B is a standard Extra Comfort Class seat located at a bulkhead and has additional legroom. Hawaiian Airlines charges an extra fee to reserve these seats. The tray table is in the armrest, making the armrest immovable and slightly reducing seat width. There is no floor storage for this seat during takeoff and landing. 11 C None No Power Seat 11 C is a standard Extra Comfort Class seat located at a bulkhead and has additional legroom. Hawaiian Airlines charges an extra fee to reserve these seats. The tray table is in the armrest, making the armrest immovable and slightly reducing seat width. There is no floor storage for this seat during takeoff and landing. 11 G None No Power Seat 11 G is a standard Extra Comfort Class seat located at a bulkhead and has additional legroom. Hawaiian Airlines charges an extra fee to reserve these seats. The tray table is in the armrest, making the armrest immovable and slightly reducing seat width. There is no floor storage for this seat during takeoff and landing. 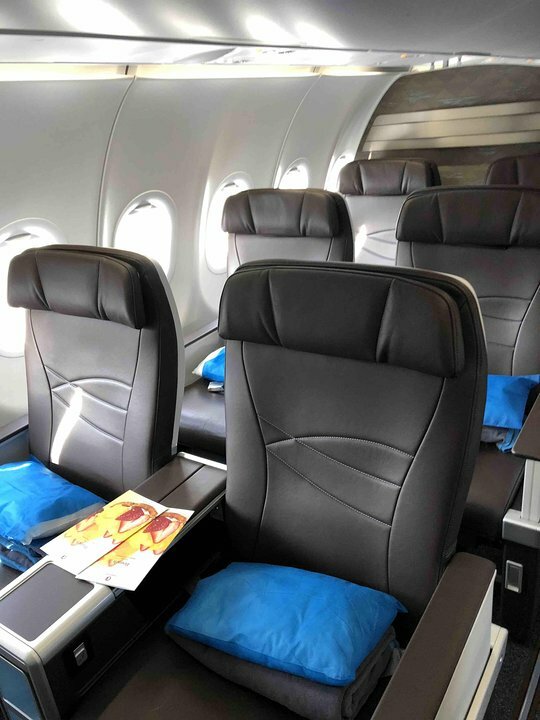 11 H None No Power Seat 11 H is a standard Extra Comfort Class seat located at a bulkhead and has additional legroom. Hawaiian Airlines charges an extra fee to reserve these seats. The tray table is in the armrest, making the armrest immovable and slightly reducing seat width. There is no floor storage for this seat during takeoff and landing. 11 J None No Power Seat 11 J is a standard Extra Comfort Class seat located at a bulkhead and has additional legroom. Hawaiian Airlines charges an extra fee to reserve these seats. The tray table is in the armrest, making the armrest immovable and slightly reducing seat width. There is no floor storage for this seat during takeoff and landing. 12 A None No Power Seat 12 A is a standard Extra Comfort Class seat. Hawaiian Airlines charges an extra fee to reserve this seat. 12 B None No Power Seat 12 B is a standard Extra Comfort Class seat. Hawaiian Airlines charges an extra fee to reserve this seat. 12 C None No Power Seat 12 C is a standard Extra Comfort Class seat. Hawaiian Airlines charges an extra fee to reserve this seat. 12 G None No Power Seat 12 G is a standard Extra Comfort Class seat. Hawaiian Airlines charges an extra fee to reserve this seat. 12 H None No Power Seat 12 H is a standard Extra Comfort Class seat. Hawaiian Airlines charges an extra fee to reserve this seat. 12 J None No Power Seat 12 J is a standard Extra Comfort Class seat. Hawaiian Airlines charges an extra fee to reserve this seat. 14 A None No Power Seat 14 A is a standard Extra Comfort Class seat. Hawaiian Airlines charges an extra fee to reserve this seat. 14 B None No Power Seat 14 B is a standard Extra Comfort Class seat. Hawaiian Airlines charges an extra fee to reserve this seat. 14 C None No Power Seat 14 C is a standard Extra Comfort Class seat. Hawaiian Airlines charges an extra fee to reserve this seat. 14 G None No Power Seat 14 G is a standard Extra Comfort Class seat. Hawaiian Airlines charges an extra fee to reserve this seat. 14 H None No Power Seat 14 H is a standard Extra Comfort Class seat. Hawaiian Airlines charges an extra fee to reserve this seat. 14 J None No Power Seat 14 J is a standard Extra Comfort Class seat. Hawaiian Airlines charges an extra fee to reserve this seat. 15 A None No Power Seat 15 A is an Economy Class seat that has limited or no recline due to the Exit Row behind. 15 B None No Power Seat 15 B is an Economy Class seat that has limited or no recline due to the Exit Row behind. 15 G None No Power Seat 15 G is an Economy Class seat that has limited or no recline due to the Exit Row behind. 15 H None No Power Seat 15 H is an Economy Class seat that has limited or no recline due to the Exit Row behind. 15 J None No Power Seat 15 J is an Economy Class seat that has limited or no recline due to the Exit Row behind. 16 A None No Power Seat 16 A is a standard Extra Comfort Class seat that has additional legroom due to the Exit Row, however, it is missing a window. Hawaiian Airlines charges an extra fee to reserve this seat. The tray table is in the armrest, making the armrests immovable and slightly reducing seat width. There is no floor storage for this seat during takeoff and landing. 16 B None No Power Seat 16 B is a standard Extra Comfort Class seat that has additional legroom due to the Exit Row. Hawaiian Airlines charges an extra fee to reserve this seat. The tray table is in the armrest, making the armrests immovable and slightly reducing seat width. There is no floor storage for this seat during takeoff and landing. 16 C None No Power Seat 16 C is a standard Extra Comfort Class seat that has additional legroom due to the Exit Row. Hawaiian Airlines charges an extra fee to reserve this seat. The tray table is in the armrest, making the armrests immovable and slightly reducing seat width. There is no floor storage for this seat during takeoff and landing. 16 H None No Power Seat 16 H is a standard Extra Comfort Class seat that has additional legroom due to the Exit Row. Hawaiian Airlines charges an extra fee to reserve this seat. The tray table is in the armrest, making the armrests immovable and slightly reducing seat width. There is no floor storage for this seat during takeoff and landing. 16 J None No Power Seat 16 J is a standard Extra Comfort Class seat that has additional legroom due to the Exit Row, however, it is missing a window. Hawaiian Airlines charges an extra fee to reserve this seat. The tray table is in the armrest, making the armrests immovable and slightly reducing seat width. There is no floor storage for this seat during takeoff and landing. 17 A None No Power Seat 17 A is a standard Extra Comfort Class seat. Hawaiian Airlines charges an extra fee to reserve this seat. 17 B None No Power Seat 17 B is a standard Extra Comfort Class seat. Hawaiian Airlines charges an extra fee to reserve this seat. 17 C None No Power Seat 17 C is a standard Extra Comfort Class seat. Hawaiian Airlines charges an extra fee to reserve this seat. 17 G None No Power Seat 17 G is a standard Economy Class seat that has additional legroom. The tray table is in the armrest, making the armrests immovable and slightly reducing seat width. There is no floor storage for this seat during takeoff and landing. 17 H None No Power Seat 17 H is a standard Extra Comfort Class seat. Hawaiian Airlines charges an extra fee to reserve this seat. 17 J None No Power Seat 17 J is a standard Extra Comfort Class seat. Hawaiian Airlines charges an extra fee to reserve this seat. 27 A None No Power Seat 27 A is a standard Economy Class seat located in the last row of the forward Economy Class section. Seat back recline might be limited due to the lavatory wall directly behind. Also, if the seat back in front is reclined, then there will be a reduction of personal space. The proximity to the lavatory might be bothersome. 27 B None No Power Seat 27 B is a standard Economy Class seat located in the last row of the forward Economy Class section. Seat back recline might be limited due to the lavatory wall directly behind. Also, if the seat back in front is reclined, then there will be a reduction of personal space. The proximity to the lavatory might be bothersome. 27 C None No Power Seat 27 C is a standard Economy Class seat located in the last row of the forward Economy Class section. Seat back recline might be limited due to the lavatory wall directly behind. Also, if the seat back in front is reclined, then there will be a reduction of personal space. The proximity to the lavatory might be bothersome. 27 G None No Power Seat 27 G is a standard Economy Class seat located in the last row of the forward Economy Class section. Seat back recline might be limited due to the lavatory wall directly behind. Also, if the seat back in front is reclined, then there will be a reduction of personal space. The proximity to the lavatory might be bothersome. 27 H None No Power Seat 27 H is a standard Economy Class seat located in the last row of the forward Economy Class section. Seat back recline might be limited due to the lavatory wall directly behind. Also, if the seat back in front is reclined, then there will be a reduction of personal space. The proximity to the lavatory might be bothersome. 27 J None No Power Seat 27 J is a standard Economy Class seat located in the last row of the forward Economy Class section. Seat back recline might be limited due to the lavatory wall directly behind. Also, if the seat back in front is reclined, then there will be a reduction of personal space. The proximity to the lavatory might be bothersome. 33 B None No Power Seat 33 B is a standard Extra Comfort Class seat that has additional legroom due to the Exit Row. The proximity to the lavatories may be bothersome. Hawaiian Airlines charges an extra fee to reserve this seat. The tray table is in the armrest, making the armrests immovable and slightly reducing seat width. There is no floor storage for this seat during takeoff and landing. 33 C None No Power Seat 33 C is a standard Extra Comfort Class seat that has additional legroom due to the Exit Row. The proximity to the lavatories may be bothersome. Hawaiian Airlines charges an extra fee to reserve this seat. The tray table is in the armrest, making the armrests immovable and slightly reducing seat width. There is no floor storage for this seat during takeoff and landing. 33 G None No Power Seat 33 G is a standard Extra Comfort Class seat that has additional legroom due to the Exit Row. The proximity to the lavatories may be bothersome. Hawaiian Airlines charges an extra fee to reserve this seat. The tray table is in the armrest, making the armrests immovable and slightly reducing seat width. There is no floor storage for this seat during takeoff and landing. 33 H None No Power Seat 33 H is a standard Extra Comfort Class seat that has additional legroom due to the Exit Row. The proximity to the lavatories may be bothersome. Hawaiian Airlines charges an extra fee to reserve this seat. The tray table is in the armrest, making the armrests immovable and slightly reducing seat width. There is no floor storage for this seat during takeoff and landing. 34 A None No Power Seat 34 A is a standard Extra Comfort Class seat that has additional legroom. Hawaiian Airlines charges an extra fee to reserve this seat. The tray table is in the armrest, making the armrests immovable and slightly reducing seat width. There is no floor storage for this seat during takeoff and landing. 34 B None No Power Seat 34 B is a standard Extra Comfort Class seat. Hawaiian Airlines charges an extra fee to reserve this seat. 34 C None No Power Seat 34 C is a standard Extra Comfort Class seat. Hawaiian Airlines charges an extra fee to reserve this seat. 34 G None No Power Seat 34 G is a standard Extra Comfort Class seat. Hawaiian Airlines charges an extra fee to reserve this seat. 34 H None No Power Seat 34 H is a standard Extra Comfort Class seat. Hawaiian Airlines charges an extra fee to reserve this seat. 34 J None No Power Seat 34 J is a standard Extra Comfort Class seat that has additional legroom. Hawaiian Airlines charges an extra fee to reserve this seat. The tray table is in the armrest, making the armrests immovable and slightly reducing seat width. There is no floor storage for this seat during takeoff and landing. 35 A None No Power Seat 35 A is a standard Extra Comfort Class seat. Hawaiian Airlines charges an extra fee to reserve this seat. 35 B None No Power Seat 35 B is a standard Extra Comfort Class seat. Hawaiian Airlines charges an extra fee to reserve this seat. 35 C None No Power Seat 35 C is a standard Extra Comfort Class seat. Hawaiian Airlines charges an extra fee to reserve this seat. 35 G None No Power Seat 35 G is a standard Extra Comfort Class seat. Hawaiian Airlines charges an extra fee to reserve this seat. 35 H None No Power Seat 35 H is a standard Extra Comfort Class seat. Hawaiian Airlines charges an extra fee to reserve this seat. 35 J None No Power Seat 35 J is a standard Extra Comfort Class seat. Hawaiian Airlines charges an extra fee to reserve this seat. 4 J None No Power Seat 4 J is a standard First Class seat. 45 C None No Power Seat 45 C is a standard Economy Class seat. The proximity to the galley and lavatory may be bothersome. The seat might be bumped from crew and passengers passing from behind. 45 G None No Power Seat 45 G is a standard Economy Class seat located in the last row of the aircraft. Seat back recline might be limited due to the wall of a bulkhead directly behind. Also, if the seat back in front is reclined, then there will be a reduction of personal space. The proximity to the lavatory and galley area might be bothersome. 45 H None No Power Seat 45 H is a standard Economy Class seat located in the last row of the aircraft. Seat back recline might be limited due to the wall of a bulkhead directly behind. Also, if the seat back in front is reclined, then there will be a reduction of personal space. The proximity to the lavatory and galley area might be bothersome. 45 J None No Power Seat 45 J is a standard Economy Class seat located in the last row of the aircraft. Seat back recline might be limited due to the wall of a bulkhead directly behind. Also, if the seat back in front is reclined, then there will be a reduction of personal space. The proximity to the lavatory and galley area might be bothersome. 46 A None No Power Seat 46 A is a standard Economy Class seat located in the last row of the aircraft. Seat back recline might be limited due to the wall of a bulkhead directly behind. Also, if the seat back in front is reclined, then there will be a reduction of personal space. The proximity to the lavatory and galley area might be bothersome. 46 B None No Power Seat 46 B is a standard Economy Class seat located in the last row of the aircraft. Seat back recline might be limited due to the wall of a bulkhead directly behind. Also, if the seat back in front is reclined, then there will be a reduction of personal space. The proximity to the lavatory and galley area might be bothersome. Hawaiian Airlines' A321neo features streaming content to your own hand-held device, tablet or computer. In order to stream content, download their app from the iOS or Google Play store before you fly and enjoy movies, TV shows and exclusive Hawaiian content. Personal device holders can be found in the tray tables of First Class as well as the first row of Extra Comfort. For all other seats in Extra Comfort and Economy, you can find device holders in the backrest of the seat infront of you. 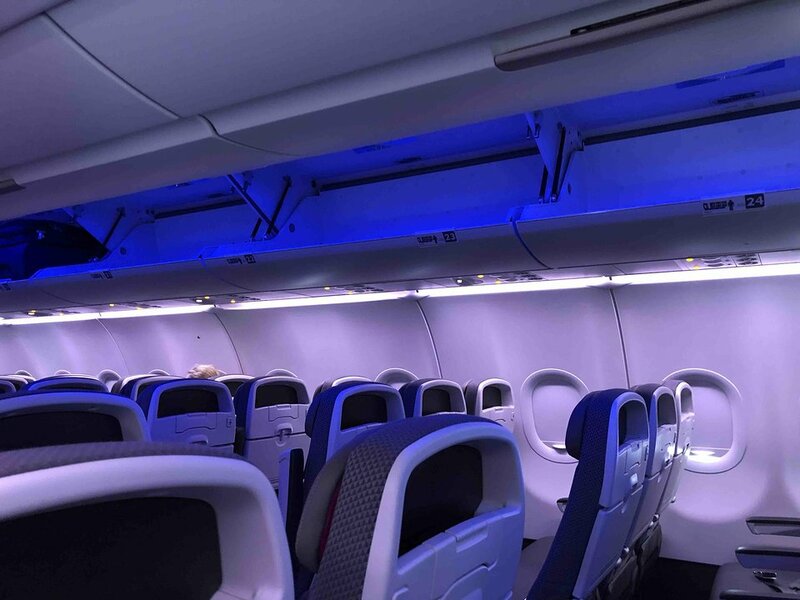 Hawaiian Airlines' A321neo seats 189 passengers in a three class configuration. There are 16 First Class seats, 45 Extra Comfort Class seats and 128 Economy Class seats. This aircraft operates flights from the west coast of North America to Hawaii. The Neo seats on Hawaiian are thinly padded so I am sore at the end of 5+ hour flight, even after getting up often. The so-called extra comfort seats are narrow too. Hawaiian has cancelled its order for more Neos and is getting the latest 737 iteration instead after the CEO abruptly left to go work for Airbus. Think about that. I sat in this seat for a rather turbulent flight to Maui. The legroom is beyond that of a regular extra comfort seat, but the arm rests were stationary, and even though my hips are rather narrow, it felt quite confining. Additionally, there was only a 6" porthole instead of any kind of window in this whole row. This aircraft flexes side-to-side aft of the wings so if you are prone to motion sickness, think about trying to get a seat over or in front of the wing. Hawaiian -- which I was told bought 19 of these because they are fuel-efficient -- should refit to fewer seats and more pitch. There is NO legroom and I am 5'1"
Worst experience I've ever had in flight. Unable to standup to exit; everyone had to stand up and get out into the aisle to exit from window or middle seat because Hawaiian has crammed so many seats onto this equipment. What should have been a chance to depart from Long Beach and avoid LAX became 6 hours of torture. Airlines most often board (only) through the entry at the front of the plane. The single aisle in the neo is so narrow that carry-ons and passengers have no recourse but to bump and grind into seats at the front; "Extra Comfort" is the worst, followed by "Economy" - but even First Class is a bummer. LGB to HNL last week. The jet is very clean, still showing its newness. The App does not start working til you board. Extra Comfort legroom was nice but we feel mislead by the promise of Complimentary Inflight Entertainment in that the only features which were 'Free' were the Audio and moving maps, any other video/movies required purchase. No blankets either as had been seen in promo videos. EC seats get you boarded before main cabin which means overhead storage is not a problem, and you deplane quicker too. The 'breakfast' box was a joke - small yogurt, a tiny bit of granola, ten grapes and a 'hard to qualify what that is' tasting mini bread loaf - glad we had a good hotel breakfast before. HA needs to do better here or eliminate altogether. LGB does not have jetways, so its a ramp or stairs at back exit - no problem though, LGB much more user friendly than LAX if your routing permits. This is listed and sold as "Extra Comfort," however, the only thing this seat has over normal seats is leg room. The wall is a large door with just a tiny pinhole window in it, and there is no armrest on the window side of the seat. It is too far from the wall to really lean on as well. The seat is rather uncomfortable. Had I not been "upgraded" to this seat (I did not pay for it), I would have been very unhappy. This really should not be considered "Extra Comfort." the seat doesn't really recline and the foot rest is on the chair in front of you rather than an extension of your own seat. the window seat has the added 3 inches of stretch space for your elbow or foot. USB and pronged electric plugs available in the middle arm rest. 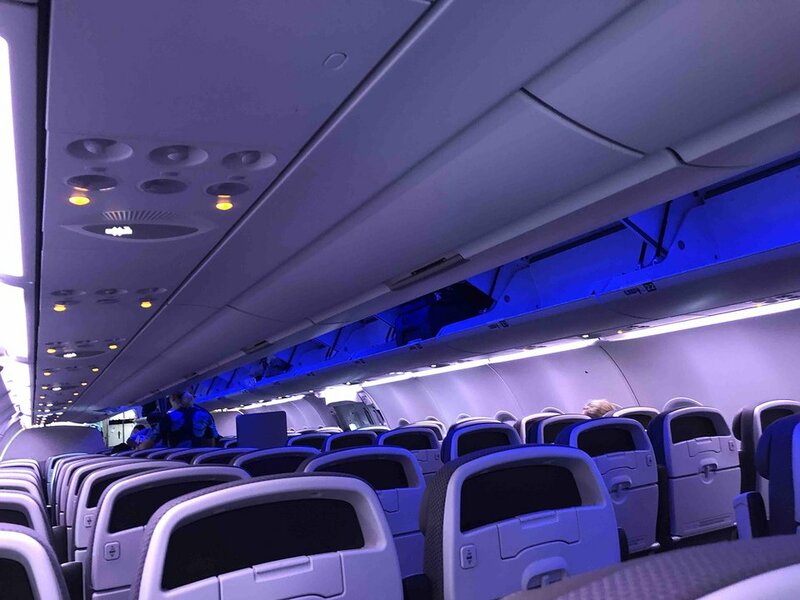 Nice new aircraft, much more cheery interior than Americans A321s. Only did a short hop LIH-HNL, seats have USB power although the tablet holder seams a bit cheaply made. Hawaiian Airlines flies 1 versions of Airbus A321 (321).